Tom Sterling was born on December 24, 1925, in Dasietta, Texas. He enlisted in the Army Air Forces on February 5, 1944, and was trained as a radio technician and then on the airborne high altitude radar bombing system on the B-29 Superfortress. He joined a B-29 bomb group in Sioux City, Iowa, in August 1945, but World War II ended before he was shipped overseas. He was then transferred to Germany where he left active duty and entered the Air Force Reserve on June 16, 1946. Sgt Sterling transferred to the Oklahoma Air National Guard on September 22, 1947, and then to the Texas Air National Guard on May 10, 1949. He transferred back to the Air Force Reserve on July 17, 1950, served on active duty from May 1, 1951, to August 1, 1952, and was commissioned a 2d Lt in the U.S. Air Force on September 11, 1952, going on active duty beginning September 22, 1952. During this time he graduated with a bachelor's degree from Southwest Texas State University in 1950. Lt Sterling next attended Electronic Countermeasures (ECM) training at Keesler AFB, Mississippi, from October 1952 to September 1953, followed by service as an ECM Officer with the 16th and the 9th Tactical Reconnaissance Squadrons at Shaw AFB, South Carolina, from September 1953 to May 1961. Capt Sterling served as an Electronic Warfare Officer (EWO) with the 10th Tactical Reconnaissance Wing at RAF Alconbury, England, from June 1961 to July 1962, and then with the 7544th Combat Support Group at Toul Rosieres AB, France, from July 1962 to August 1963. After attending the Communications Electronics Staff Officer Course at Keesler AFB from August 1963 to June 1964, Maj Sterling served as Chief of Radar Maintenance with the 507th Tactical Control Maintenance Squadron and then as a Project Officer with the 507th Tactical Control Group at Shaw AFB from July 1964 to August 1965. His next assignment was as an instructor with the Air Control Systems Division at Eglin AFB, Florida, from August 1965 to August 1966, and then as an EWO with the Tactical Air Warfare Center at Eglin from August to November 1966. After completing F-105 Thunderchief Wild Weasel Combat Crew Training, Maj Sterling served as an F-105 EWO with the 357th Tactical Fighter Squadron at Takhli Royal Thai AFB, Thailand, from February 1967 until he was forced to eject over North Vietnam and was taken as a Prisoner of War on April 19, 1967. After spending 2,147 days in captivity, LtCol Sterling was released during Operation Homecoming on March 4, 1973. He was briefly hospitalized to recover from his injuries at Keesler AFB, and then served as assistant to the Wing Commander of the 3246th Tactical Wing at Eglin AFB before retiring from the Air Force on September 1, 1974. He met Barbara Jo Stephens in January 1944 while visiting family in Sabinal, Texas, and they were married from April 4, 1947, until her death on December 22, 2010. Tom Sterling died on January 19, 2013, and was buried at Barrancas National Cemetery on NAS Pensacola, Florida. For gallantry in connection with military operations against an opposing armed force as an F-105F Electronics Warfare Officer of the 357th Tactical Fighter Squadron, Takhli Royal Thai Air Base, Thailand, in action near Hanoi, North Vietnam, on 19 April 1967. 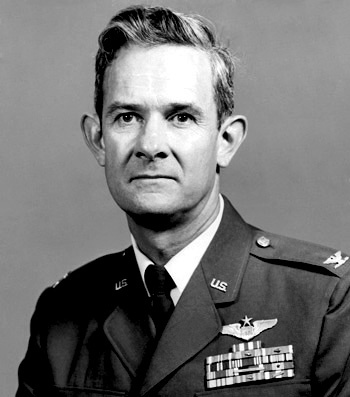 On that date, with complete disregard for his personal safety, Major Sterling calmly and aggressively manipulated his electronic detection gear to assist in engaging surface-to-air missile sites threatening the fighter-bomber force in the target area, and directly contributed to the successful placement of ordnance on a surface-to-air missile installation. By his gallantry and devotion to duty, Major Sterling has reflected great credit upon himself and the United States Air Force.